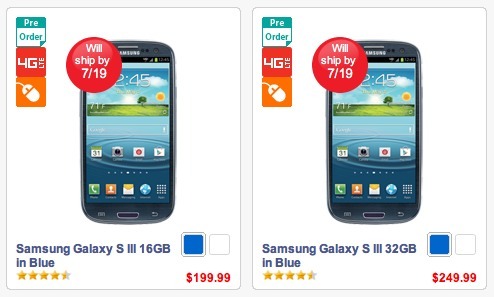 With the Samsung Galaxy S3 on Verizon now launching July 12 instead of the earlier announced 10th, it looks like online orders are getting a bump back as well. Last seen with an estimated shipping date of July 11, your orders through Big Red’s official site will no longer ship until July 19. We are assuming this only affects those who ordered within the last day or so and not those that ordered last week or the week before. We know that many of you have either already received your pre-orders or are expecting them in the next day. Update: We have heard from a handful of readers that pre-ordered long ago and are now getting pushed back to July 19. Yikes. If you were considering an online order, you may want to think about heading into a store instead. Cheers Jeff, Mike, and Scott! Verizon Pushes Galaxy S3 Launch to July 12?